Westcott Cottage dates back to the 1860's, but while the rustic charm and history of the building can be seen and felt at every turn, the interior has been lovingly renovated to add modern day creature comforts. The accommodation is attached to the main residence, but separated by the original thick stone walls that once formed the exterior walls of the small cottage. The cottage is completely self contained. It has it's own private entrance, and sits in a secluded garden with views to the historical barn. The pretty garden provides a peaceful space to enjoy breakfast or shady spot to enjoy a barbecue or glass of wine on a warm day. Guests will have use of a completely self contained cottage with access via a key safe at the entrance, so you can arrive whenever you like. The cosy cottage consists of a living room with a dining area, spacious bedroom, kitchenette and bathroom. This space makes for a perfect getaway for couples, a quick business trip or even a bit longer stay. The bedroom contains a queen size bed with a fluffy down doona, linen cover and fine cotton sheets. Extra blankets and an electric blanket provide extra warmth for those cold, wintery nights. There’s a coat stand for hanging space and a chest of drawers adds storage for personal belongings. The living room is bright with a comfy sofa with lots of cushions and throws for you to snuggle up on. The sofa converts to a single bed for a third guest if pre-arranged. From the dining table you have views into the lovely, sunny garden. There's a large TV with a full range of free to air channels, and a DVD player with some movies provided, although best to bring your own favourites. A bluetooth speaker from which to play music from your own device can be used inside and out and there's panel heating to keep you cosy. The kitchenette is well equipped for simple meal preparation, (microwave with microwave cookware, toaster, sandwich maker, electric jug, coffee plunger). There are basic pantry supplies, a variety of tea and coffee, also a few breakfast supplies for your first morning to allow you a relaxing start to your stay. A BBQ sits in a sheltered outdoor space if you would like to prepare a more substantial meal. There's also a small fridge and washing machine in the kitchenette. The bathroom includes the toilet, vanity, mirror and shower, with towels and soaps provided. Westcott is situated on four acres on the outskirts of Ballan, and backs onto the meandering Werribee River. The river valley is a quick, easy walk and you'll often see wildlife such as kangaroos, wallabies and an array of bird life. Listen out for the kookaburras and keep an eye out for the occasional eagle hunting for prey. Also keep an eye out for the elusive platypus that frequent this section of the river. The cottage is equally close to the centre of town, just a 500m stroll to the centre of town and less than 1km to the train station. Our family consists of a menagerie of furry and feathered creatures. Buddy is our hilarious Border Collie. Our rooster protects his harem of girls and crows throughout the day. Our three alpacas - King Charlie and his cohorts, Betty and Svetlana, love apples. None of these family members have any access to your private space. It's all yours! Along with your private garden area, guests are also welcome to access the treed river area of our property (please read the directions on the house info sheet in the cottage for access details) There's a picnic area by the river, a good place for an evening glass of wine to watch the sunset or where you'll often see a platypus playing if water levels are good. You can also feed the alpacas some treats from here - their all time favourite ... apples! NOTE: Guests are requested not to enter areas marked private or enter the animal enclosures. Westcott is a NO SMOKING property. Smoking is permitted outside providing butts are disposed of thoughtfully & thoroughly! Ballan is a charming, peaceful country town and especially picturesque as the autumn leaves change colour. The Autumn Festival held in late March gets bigger and better each year. There are cafes, op shops and markets to visit as you wander around or call into the pub to enjoy some local bluegrass music and some pub grub! Ballan is also home to the Mill Rose Quilting Cottage, well known by those with a passion for quilting. For the sports minded there's a lovely golf course set along the banks of the Werribee River, which runs the entire way through the town, the excellent polo field of the Yaloak Polo Club and great fishing at the regularly stocked Bostock Reservoir. This area is also perfect for barbecues and a walk around the water or through the bush. Around Ballan there are several mineral springs to visit, don't forget your water bottles to fill. There's also many renowned bushwalking areas to explore. Ballan is the gateway to the Daylesford spa mecca, but a somewhat quieter option for accommodation. In less than 30 minutes you can drive to historical Ballarat, Trentham, Creswick or Blackwood or explore the Werribee and Lerderderg Gorges and The Brisbane Ranges. For those with a green thumb there are many outstanding nurseries in the area. Blackwood has two, Blackwood Ridge Nursery & Cafe and The Garden of St Erth, both worth a visit. The famous Lambley garden and Nursery is also not far away. Myrniong and St Anne's Winery are home to various food & music festivals and markets throughout the year. Gordon through to Daylesford area is also well known for its truffle farms. Coming into the colder months there are many truffle adventures and feasts to enjoy, which are definitely worth a visit. Even though temperatures may not look so inviting, these events do book out quickly. Bring your warmest winter woolies. In Ballan you'll find a well-stocked IGA, perfect for grabbing snacks, food supplies and alcohol (for a small town their selection is good). There's also a host of other amenities in town including a local Butcher, Bakery, swimming pool, hardware, medical clinic & hospital. Hopefully the later won't be required during your stay. If driving from Melbourne you may like to take a detour through the Bacchus Marsh fruit and veggie growers area, running along the Avenue of Honour. You can pick your own fruit or simply buy fresh produce direct from the growers. We'll provide you with continental breakfast supplies for your first night so you can have a leisurely start to your stay. These will be left in the kitchenette prior to your arrival. This will include some of our free range girls' eggs when seasonally available. While we have listed Wifi as available, it can be intermittent, to non existent, therefore if you're relying on Wifi during your trip, Westcott may not be the best option for you. Telstra based providers seem to work best in this area. Getting to and from Ballan is easy. Ballan is less than 80kms from Melbourne (Western Hwy). This will be under an hours drive (non peak hour). The railway station is on the Ballarat line and provides regular services to Melbourne (55 mins) and Ballarat (20 mins). If arriving by train we may be able to organise a pick up and drop off if pre-arranged (depending on our schedules for the day). The town centre is less than a 10 minute walk and Westcott Cottage about a 15 minute walk from the station. An airport shuttle bus service stops in Ballan, providing easy access to and from Melbourne's Tullamarine Airport. The booking allows for 2 people sleeping in the QS bed.The single sofa bed is available if booked for a third person in your group. Bookings are a 2 night minimum, with public holidays attracting a longer minimum stay. After years of inner city living, we felt the country calling. Desperate for a big vege garden, a few chickens, a menagerie of fury creatures and some form of self sufficiency, we began the search for a property. We now call Westcott in Ballan home. Loving country living! Westcott screamed out to be rescued. It was a massive project, but worth the effort. Run as a maternity hospital in the 1920's - 40's, many of the elderly Ballan residents were born here, so there are many stories to be told about this property, and much sentiment for Westcott within the town. The property is almost 4 acres on the edge of town and backing onto the Werribee River. What was not to love about this property... Set on hill with views down the river valley to the Wombat State forest, and steeped in history. Not to mention a barn to die for! Westcott is a lovely, old rambling house with an amazing old barn that once watered Cobb and Co horses. The view from our living area to the country side and forest is amazing, especially given the property is within Ballan township. It is situated on the edge of the goldfields and in spa country. The stunning autumn colours bought on by freezing winters, give way to the most spectacular spring blossoms. We love the four seasons in this area. Within a 30km radius of Ballan there's so much to explore. There are many historic towns and sites, great food and wine, fantastic walks and beautiful countryside. The bathroom has all the usual requirements. Vanity, shower and toilet! There's an iron, hairdryer and first aid kit in the vanity, along with extra toilet paper. There's plenty of hooks to hang towels and a drying rack should you need to wash and dry any clothes on your trip. Soaps, shampoo and conditioner are provided. Westcott is on the outskirts of the small rural village of Ballan and sits on a 4 acre property. We are a 5 minute stroll to town or a 5 minute walk to the river valley and its rural environment. There are panel heaters in the living room and bedroom. The bathroom has a radiant wall heater. All bedlinen is provided. If the sofa bed is booked for a third person, linen, pillows and doona will be left for guests to make up. This allows for use of the couch before retiring for the night. The washing machine is in the kitchenette and for your private use. Laundry detergent is in the bathroom vanity. There's a clothes rack in the bathroom to hang washing on. Parking is directly out the front of the gate to the cottage. If you have a larger vehicle or more than one car, theres plenty of space to park further along, in front of the barn. We do have WIFI internet; however the signal in the cottage extremely weak due to the thick stone walls. If you're relying on internet this is probably not the place for you. Apologies for this! Bath towels, hand towels and tea towels. We leave one towel per guest for short stays (to help save on water). Bar fridge size, but also has a small freezer for ice. The microwave can be used to make simple meals as there's a microwave egg poacher, vegetable steamer and food cover for cooking a variety of food items. Pantry items supplied include: Milk, Olive oil, balsamic, salt, pepper, sugar, ground plunger coffee, instant coffee, tea leaves and a variety of teabags. The private kitchenette is well equipped for simple meal preparation. There's a fridge, microwave, toaster, sandwich maker & coffee plunger. Also coffee, a variety of teas & basic pantry supplies. The dining table sits within the living room and has views to the garden. It can seat up to 4 people. There are two chairs, but the small tables in living room double as stools for extra seating. The speaker is a portable BT speaker that can be paired with your own device for music or radio. This may also be taken outside for use in the garden. DVD player is provided, along with a few limited movie titles. A few movies and mini series are provided, but it might be worth bringing your own favourite movies. The secluded garden is outside the living room. The cottage garden changes with the seasons. A small garden setting for 4 sits under the trees for shade in summer, but is bathed in sun for winter. We have three lovely alpacas that our guests are welcome to visit and feed. Thanks for staying at Westcott Carol. The garden is lovely throughout all the seasons! thanks for staying with us Jim and for your kind words. 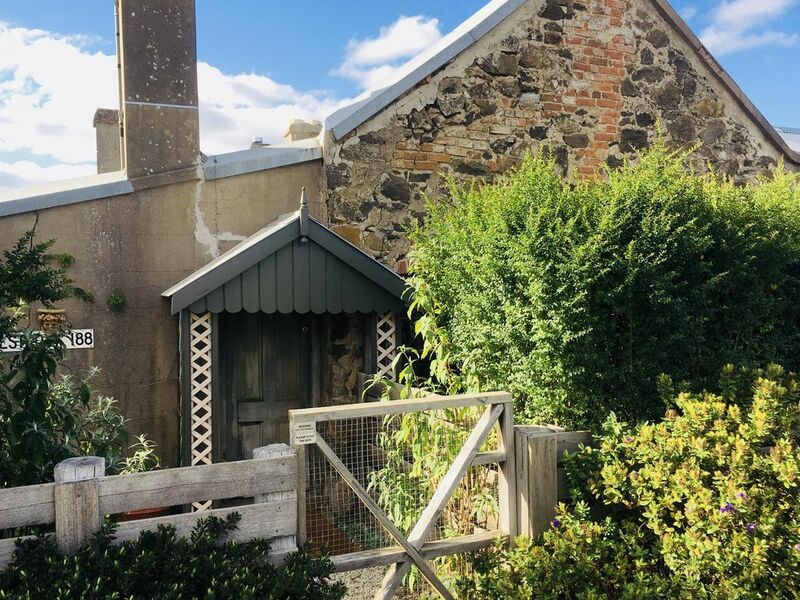 A cosy cottage, easy to find, with easy driving access to Melbourne for business or to explore the local wineries and eateries. Very clean, comfortable and well appointed. The private garden is very relaxing with birds fluttering about. Thanks for staying at Westcott Martin and for your review. Hope to see you again if you revisit the area. Thanks for taking the time to write a review Amy. You certainly had shocking weather, but I'm pleased you found the cottage comfy regardless. Absolutely loved the cottage, very comfortable and welcoming. Will certainly be going again! I wish we could have stayed longer and enjoyed the literature on offer in the warmth and comfort of this gorgeous cottage. We thoroughly loved the decor and facilities. A true gem and so easy to reach!!!!! Clean and comfortable. A lot of effort was put into making my stay comfortable and ensure I felt welcome. Attention to detail is an understatement!!! everything has been though of to make sure all guests have everything they need during their stay. Ballan is a charming, peaceful country town and especially picturesque as the autumn leaves are changing colour. There's an Autumn festival held late March, attracting more people each year. There's cafes, op shops and markets to visit as you wander around or call into the pub to enjoy some local bluegrass music and some pub grub. The bluegrass music scene is thriving in the area and there are many events held locally. Ballan is also home to Mill Rose Quilting shop and gallery. Mill Rose is very well known by those with a passion for quilting and also has a lovely cafe. The local farmers market is held every second Saturday in the Mill Rose carpark. For the sports minded there's a lovely Golf course, and other popular courses close by, such as the one at Trentham. There are many bushwalking and hiking sites, all within a 20 minute drive, Werribee Gorge, Brisbane ranges, Blackwood, Lerderderg Gorge, just to name a few. The historic Goldfields towns, such as Creswick, Dayelsford, Blackwood and Clunes provide many walks for those wanting a less strenuous, but history filled outing. There are many wonderful nurseries in the area. The Garden of St Erth is a short drive to Blackwood, which is also home to the stunning Blackwood Ridge Nursery and cafe. Lambley Nursery on the other side of Ballarat is a must if in the area. Dayelsford and Hepburn Springs is the spa mecca of Victoria, but these towns have so much more to offer than just a relaxing massage. There a many wonderful restaurants, cafes and food experiences to try. For a special treat lunch at the stunning Lakehouse will not disappoint! Dayelsford is also home to some amazing galleries. David Bromley's is well worth a look in. For those with a passion for truffles, there's no place better to be in winter. There are many truffle farms around Ballan, running from Gordon through to Dayelsford. During the short lived truffle season they team up with many of the restaurants in the area to provide the ultimate truffle experience. The Myrniong Pub/restaurant is a great place to experience this. From truffle hunting on farms with the dogs to eating a delicious meal, this is a wonderful experience for all who have the truffle bug.